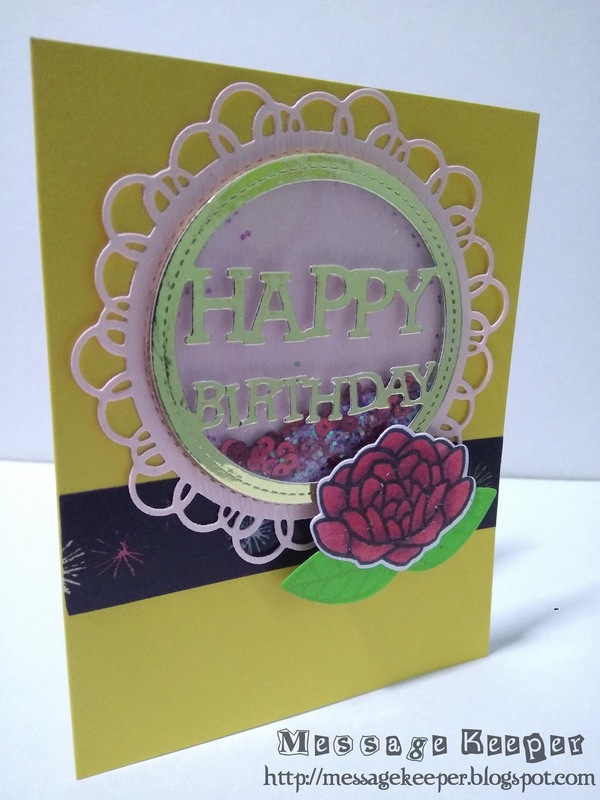 Made another birthday card as I was inspired by the tools on hands that has been taken out when I was made another card earlier as well my crafty hands are itching to make more. For this card, I am adopting the sketch from Freshly Made Sketches #309 - A Sketch by Linda as shown above. 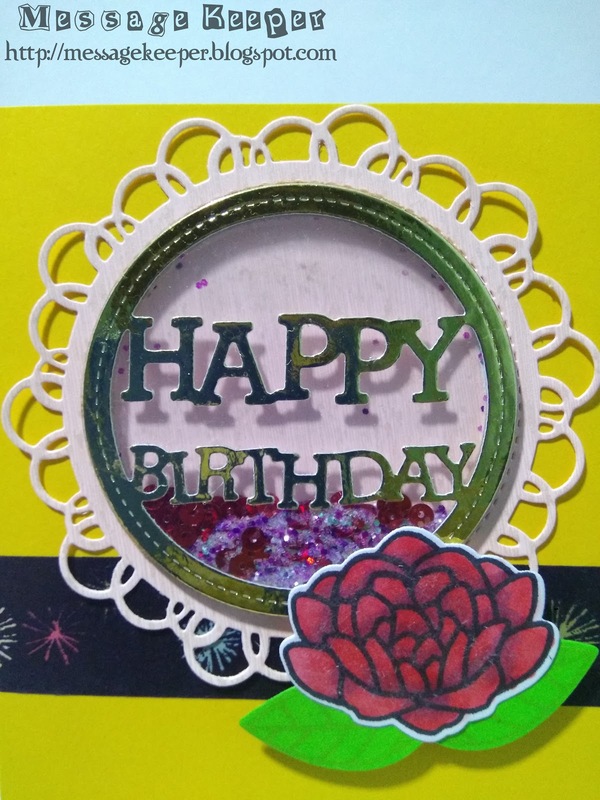 I decide to make a shaker card as I would like to use the Memory Box Stitched Happy Birthday Circle Frame Die as the shaker front where all the confetti of sequins and glitter flakes shake behind the stitched happy birthday circle dies. So, I die cut the Memory Box Stitched Happy Birthday Circle Frame Die onto a gold foiled card stock and foam. For the foam circle die cuts, the 'happy birthday' wording are trimmed away so that I can use the stitched circle alone as one of the shaker component because the circle dies sizes I have on hands are no match to this Memory Box Stitched Happy Birthday Circle Frame Die. Another open scalloped stitched circle is die cut onto a metallic embossed pink card stock and plastic to be the base of the shaker component and window. The open scalloped stitched circle plastic need to be trimmed to fit the gold foiled stitched happy birthday circle dies. 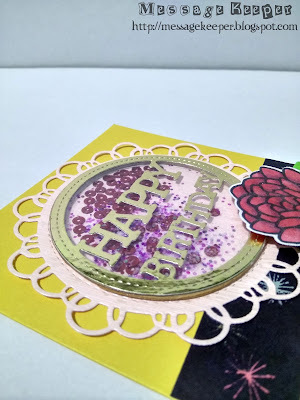 The components are assembled and finally, some red sequins and purple and white glitter flakes are filled in the center of the metallic embossed pink open scalloped stitched circle die before closed it down with the stitched happy birthday circle frame. As the sketch requires another embellishment, a flower is stamped, colored using Copic markers and die cut using matching dies. Leaves are stamped onto green card stocks, die cut using matching dies and attached behind the flower. On a gold card base, a fireworks pattern washi tape is put on as in sketch follow by the shaker element. 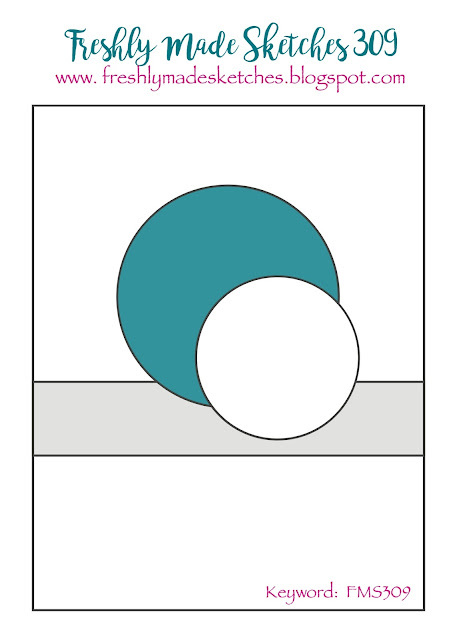 The flower is attached onto the card as in sketch using foam tape and it have to be doubled up to cater the shaker element heights. 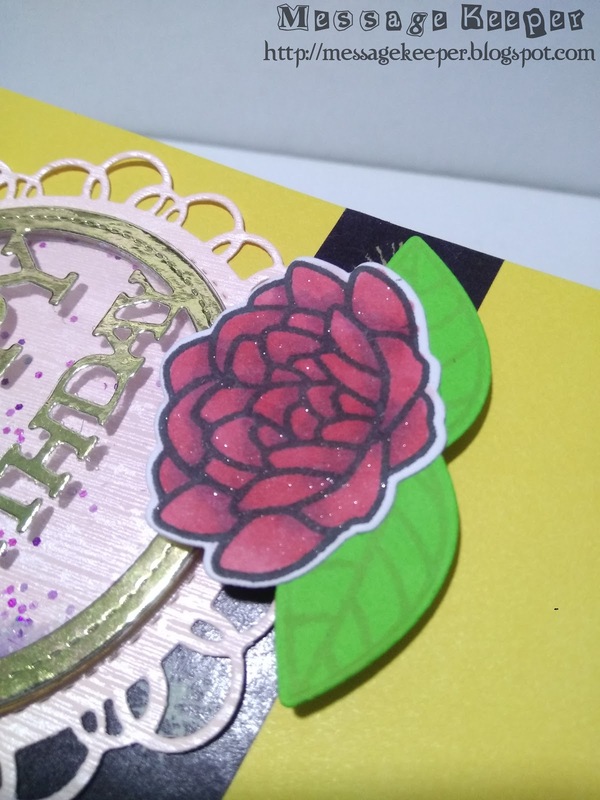 The card is finished off by adding some shimmer onto the flower. Very pretty! Love the delicate die cut circles. Thanks for joining us at Stamp Ink Paper, hope to see you again soon! Your shaker card is so pretty! Love the colors and that beautiful flower! Glad you joined us at FMS! Gorgeous card! Love the shaker element! Thanks so much for joining us at Freshly Made Sketches. Awesome shaker card, that die is fantastic and I love how you used it! Thanks for joining us at 7 Kids!